Want to be notified of new releases in sakaki-/bcmrpi3-kernel-bis? Automated build of a tweaked version of the latest 64-bit bcmrpi3_defconfig Linux kernel for the RPi3B/B+, updated weekly. This project contains a weekly autobuild of the default branch (currently, rpi-4.19.y) of the official Raspberry Pi Linux source tree, for the 64-bit Raspberry Pi 3 Model B and B+. As with its sister project bcmrpi3-kernel, the baseline build configuration is the upstream bcmrpi3_defconfig, wherein the first 12 hex digits of the tip commit SHA1 hash are appended to CONFIGLOCALVERSION (with a separating hyphen). However, in this project, -bis is additionally appended to CONFIGLOCALVERSION, and (more importantly) additional tweaks are also applied to the kernel configuration before building, by running the conform_config.sh script. If you have changes you'd like to apply to the kernel config used by this project, please submit a PR targeting the conform_config.sh script. Changes should target the end of the script. Only edits which use the bundled convenience functions set_kernel_config and (rarely) unset_kernel_config will be considered for merging. Modularization is prefered wherever possible. Please include a short comment describing the changes, ideally including a link or bug ID. A new build tarball is automatically created and uploaded as a release asset each week (unless the tip of the default branch is unchanged from the prior week, or an error occurs during the build process). The versions of the builds in this project will always mirror those of bcmrpi3-kernel, commencing 1 June 2018. The default branch is used, as that is generally given most attention for e.g. VC4 backports. As an (historical) example, on 1 June 2018, the default branch was rpi-4.14.y (NB, it is rpi-4.19.y now), and the latest commit was 4fca48b7612da3ff5737e27da15b0964bdf4928f (the short form of which is 4fca48b7612d). The created release was 4.14.44.20180601, within which the kernel tarball was bcmrpi3-kernel-bis-4.14.44.20180601.tar.xz, and the corresponding kernel release name was 4.14.44-v8-4fca48b7612d-bis+. The corresponding kernel configuration (derived via make bcmrpi3_defconfig && conform_config.sh && make olddefconfig) may be viewed here. The 'baseline' bcmrpi3_defconfig may be viewed here, the conform_config.sh script may be viewed here, and a diff between the 'tweaked' and 'baseline' configurations may be viewed here. A list of all releases may be seen here. NB: these prebuilt kernels and ebuilds are provided as a convenience only. Use at your own risk! Given that the releases in this project are created automatically, and particularly since they include user-submitted tweaks to the 'official' bcmrpi3_defconfig, there is no guarantee that any given kernel will boot correctly. 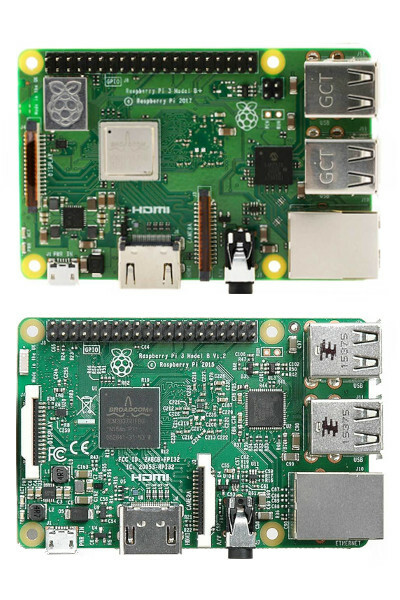 A 64-bit kernel is necessary, but not sufficient, to boot the RPi3 in 64-bit mode; you also need the supporting firmware, configuration files, and userland software (see for example my gentoo-on-rpi3-64bit project, or NeddySeagoon's Raspberry Pi 3 64 bit Install page on the Gentoo wiki, for more information).